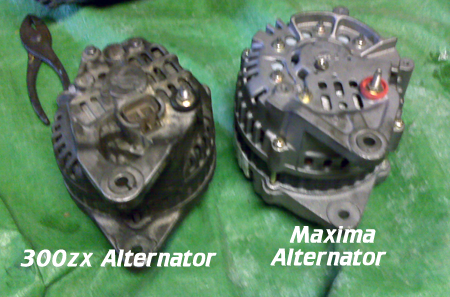 If you are thinking about swapping in a maxima alternator into your Z car, here is a little background on what is needed to do this install. The number one reason to swap to the maxima is that the output is 90 amps as opposed to the Z's stock 70 amps. This will give you little extra electrical power to run a stereo system or electric fans in place of the stock clutch fan. 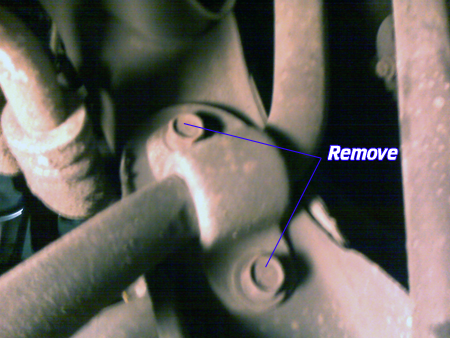 Remove the 4 nuts which hold the fan & clutch onto the fan pulley (10 mm open). Be careful not to drop the lock washers. Next remove the 10 mm bolt holding the fan shroud to the air filter support. Pop the fan side of the shroud off of the radiator side and remove the fan and shroud at the same time. Put 2 of the fan's nuts back on the studs to keep the pulley from falling off the waterpump. Jack the car up and support it with jack stands. If your car still has the splash shield, Remove it by removing the 10mm bolts or Philips head screws depending on year. 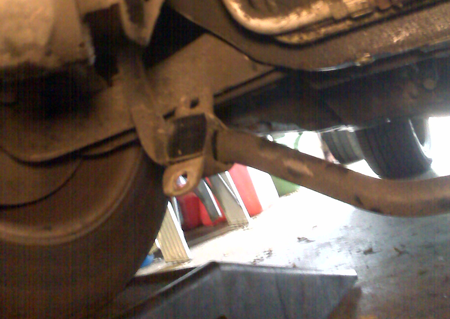 Remove the 4 14mm sway bar to body bolts and let the sway bar hang down from the end links. 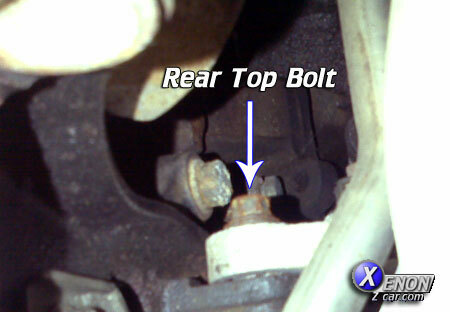 Remove the alternator Drive belt by loosening the tensioner nut (12mm) and then the locking bolt(12mm). 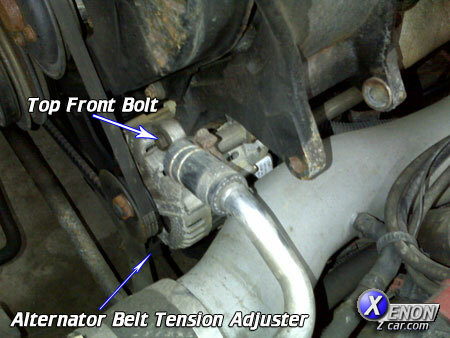 Also remove the top bolt holding the lower alternator bracket to the motor. This is to allow clearence for the alternator. 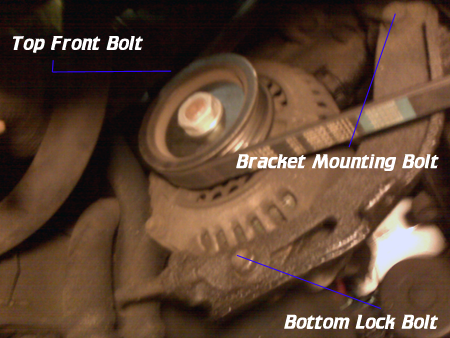 Now from the rear of the alternator remove the one retaining bolt and unplug the connector. On the front side of the alternator remove the remaining retaining bolt and turn the alternator around to better access the remaining bolt that holds the wiring to the alternator. 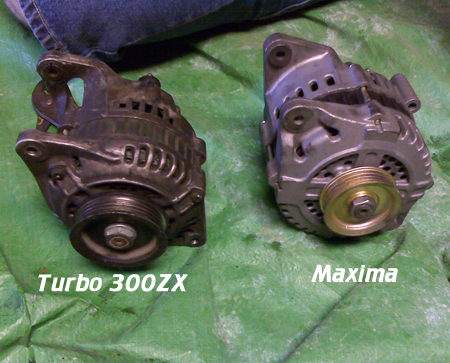 The first thing you will notice if you have a non turbo car is the pulley on the maxima alternator is different. The maxima uses a ribbed belt verses the v-belt on the non turbo cars. 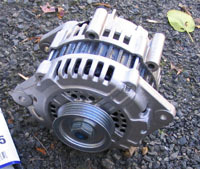 To use this alternator you will need to decide weather or not to change over to the ribbed belt setup or to change the pulley on the alternator. If you are going to use the V-belt pulley you will need to have the shaft hole enlarged as the shaft is larger on the maxima alternator and add a spacer for the correct offset of the pulley. You also can swap your crankshaft pulley for a turbo one and use the serpentine belt setup. This will require a new belt. Other than this it is a direct bolt in for the non turbo guys. If you have a turbo car, you may need to grind away a little of the inside part of the alternator tensioner bracket in order to get it to work as the housing of the alternator is a bit larger. Other than that it is a direct bolt in upgrade. Other nissan alternators can also be used in the Z31 but you may need to modify the Alternator bracket and adjuster more than a little grinding. I have seen Nissan Maxima (90amp), Nissan 350Z (110 Amp), Nissan Quest Alternators (125amp), Nissan Titan (130amp), All used with various small modifications.